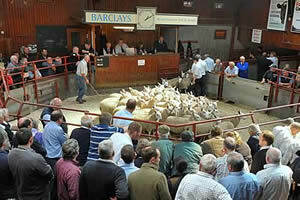 The Cumberland & Dumfriesshire Farmers Mart had forward 5,151 Store Lambs and Feeders at their Weekly Sale at Longtown on Tuesday 13th December, 2011. With all the usual buyers present and a great show of sheep for the time of year, all classes easily maintained late extreme rates. Top of £91.50 for Suffolks from Hazelbank; Texel £90.50 Springwell, £89.50 Netherplace and Bensons Fell, £88.50 Hyndlee; Beltex £88.50 Walton Woodhead, £87.50 Pinegrove; Charollais £86.50 Middle Farm; Greyface £80.50 Glenkiln, £78.50 Springwell, £77.50 Westerburnhope and Hazelbank; North Country Cheviot £80 North Synton and Cottage Farm, £79.50 Alnham Castlehill and South Mains, £78.50 Meikle Whitriggs; Lleyn £78.50 Windyknowe; Half Bred £78.50 South Mains; Blackface £74.50 Dalveen, £70.50 Lamperts, £68.50 Alnham Castlehill; Romney Marsh £73.50 Rammerscales; Herdwick £70.50 Blacksmiths Cottage; Swaledale £64.50 Brigg, £59.50 Blakelaw and High Street. Hill Cheviots (1,206) again a good entry and a marvellous trade. Top of £70.50 Skelfhill, £69.50 Granton, £68.50 Bloch and Carlenrigg. Cast ewes to £93 Upper Minnygap, hill ewes to £78.50 Alnham Castlehill. Cast rams to £117 Maxton House. The 80 Shetland ewes created a lot of interest to a top of £49 and £48 from Maxton House.